Ada Virginia Olivia Pittman Blackman affectionally known as Bunch was born on October 25, 1915 in Ensley, Ala. A daughter of Dennis an5d Mary Bell Knox Pittman. 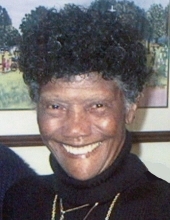 Ada was educated in the public school system in Fairfield, Ala. After graduation from Fairfield High School she went on to further her education while attending Miles College earning her bachelors degree on May 31, 1944. Shortly thereafter she gained employment at Atlanta Life Insurance Company. In 1948 she relocated to Pittsburgh Pa. and fulfilled her childhood dream of becoming a school teacher. She soon landed a job teaching for the public school system in Pittsburgh. She taught many generations of students in the Pittsburgh School System. Accepting Christ at an early age she joined Central CME Church in Pittsburgh upon relocating. There she served on the Missionary Society as well as Sunday School teacher. In her spare time Ada loved to travel. She also served as a past president of the Housing Tenants Counsel as well as a board member of the Pittsburgh Housing Authority. She leaves to cherish her precious memory her one and only son William (Bill) McKenzie 5 grandchildren Joy L. McKenzie, Dennis F. McKenzie(Tawina) all of Tacoma, Washington, Joel Smitherman(Aura), of Tacoma, Washington, Rodney Smitherman(Elaine) Wenatchee, Washington, and Sheila L. Price(Willie) of Mt. Vernon, Washington. Twelve great grand, 24 great great grands, 7 grand nephews, 10 grand nieces and a host of relatives and friends. Preceding her in death is her parents Dennis and Mary Pittman, beloved husband Edward Blackman, Johnny L Davidson (Claude S) Dennis E Pittman (Katherine) and Charles H Pittman. Special mention nephew Hugh A. Davidson and nieces Mabel H. Poindexter and Cora I Perkins whom she recognized and loved as her children. Funeral Services will be held on Friday March 29, 2019 at 11:00a with a viewing 1 hour prior to services. To send flowers or a remembrance gift to the family of Ada V. Blackman, please visit our Tribute Store. "Email Address" would like to share the life celebration of Ada V. Blackman. Click on the "link" to go to share a favorite memory or leave a condolence message for the family.